Outcomes matter. They are where the buck stops. They are the proof in the pudding. When someone says ‘show me the money’, what they really want to see are the outcomes. Outcomes are important for conducting and interpreting research. As we have discussed previously in the Nuts and Bolts of EBM series (see Part 2, Q1,), the PICO format is useful when constructing a research question or when using published research to answer a clinical question… Need I point out that the ‘O’ in PICO, stands for ‘outcomes’? But wait there is more… Outcomes are also important for assessing the quality of care provided by healthcare services. In the ICU world an important example is the ‘SMR’ or standardised mortality ratio. That is why, as evidence-based clinicians, we need to know the ‘ins and outs’ of outcome measures. Q1. What exactly are outcomes or endpoints? In clinical trials, outcomes and endpoints are the same things. They are the response variables used to compare groups (i.e. the intervention group(s) and the comparison group(s)). A response variable is a particular quantity that we ask a question about in a study, which is influenced by explanatory variables (such as the presence or absence of an intervention). Most trials have several outcomes, some of which are of more interest than the others. As clinicians, we need to assess the importance of an outcome measure when we read a paper to determine its external validity. Remember, external validity refers to the generalizability of the study to your own patients (see Part 1, Q3). Whenever we read a paper we should ask ourselves, does this outcome measure really matter? Then we should look at the effect size (if any) for the outcome of interest and ask ourselves if that really matters too. Q2. What is the difference between a primary and secondary outcome? The primary outcome is the pre-specified outcome considered to be of greatest importance to relevant stakeholders (such a patients, policy makers, clinicians, funders… but especially patients!) and is usually the outcome used as part of the trial’s sample size calculation. Some trials may have more than one primary outcome. However, this is not recommended as it incurs the problems of interpretation associated with multiplicity of analyses (Wikipedia calls this the multiple comparisons problem). Secondary outcomes are endpoints that are of interest, but for which the trial was not explicitly powered to detect differences in. In most circumstances they should not be used to guide clinical practice but may suggest areas for further research or help explain the result obtained for the primary outcome. Q3. What are composite outcomes and why are they used? A composite outcome is a somewhat arbitrary combination of multiple endpoints that are treated as if they are a single endpoint. It typically includes mortality combined with one or more major co-morbidities. Given these issues, composite endpoints are best avoided if possible. Ultimately, they are problematic because it is difficult to appropriately assign weightings to the individual endpoint components, which typically vary in importance. Q4. What are patient-centered outcomes? Patient-centered outcomes are those that reflect the way a patient “feels, functions and survives” (to quote a CICM exam report!). They are also referred to as patient-orientated outcomes. A famous example is the CAST trial. In the 1980s it was known that many patients died from dysrhythmias after myocardial infarction. This it was hypothesised that using an antiarrhythmic drug like flecainide to suppress premature ventricular contractions (PVCs) would help patients. Flecainide proved to be good as suppressing PVCs. However, it was also associated with increased rates of sudden cardiac death and all-cause mortality… patient-centered outcomes that matter! These outcomes have various pros and cons, of which CICM examiners have in the past thought important, as described in the LITFL CCC entry on ICU Outcomes. Surrogate outcomes often don’t have these problems, at least not to the same extent. Q5. What are surrogate outcomes and why are they used? Surrogate outcomes are biomarkers intended to substitute for a clinical endpoint and expected to predict clinical benefit or harm based on epidemiologic, therapeutic, pathophysiologic, or other scientific evidence. Unfortunately, much of the evidence for clinical interventions is based on surrogate outcomes, rather than outcomes that actually matter to patients. In some cases surrogate outcomes mutate into actual disease entities (such as hypertension). However, as discussed above, disease-orientated outcomes are not as useful as patient-centered outcomes for clinical decision making. A reasonable use of surrogate outcomes is in Phase II trials. Here it is important to see if an intervention may have efficacy, before embarking on an appropriately powered Phase III trial using patient-centered outcomes to definitively prove clinical effectiveness. However, when surrogate outcomes are used in research, it is best to use clinical endpoints rather than non-clinical endpoints such as biomarkers. Biomarkers are often difficult to validate and rarely translate into clinically meaningful outcomes. A good rule of thumb is that, unless validated against a patient-centered outcome, surrogate outcomes should not be used to change clinical practice. Treatment of surrogates outcomes can lead to unintended consequences… particularly if they are used to guide healthcare. Surrogate outcomes may lead to distraction from patient-centered outcomes and may be subject to ‘gaming’ to meet performance indicators (e.g. 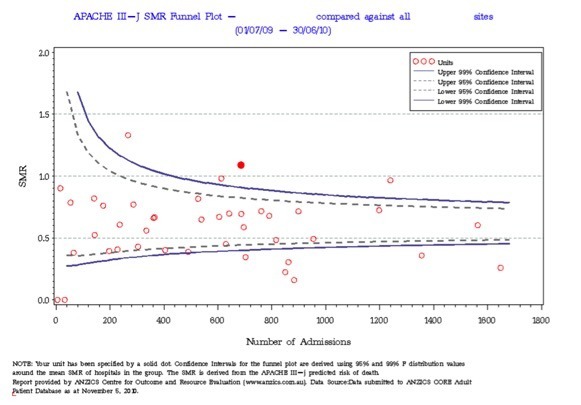 the ‘4 hour’ rule, ICU readmission rates, and CLABSI rates). Q6. Why are “[support] free days” preferable to duration or length of stay? Most effective ICU interventions will have only a small effect on overall mortality. To detect such differences very large sample sizes would be needed to generate enough ‘events’ to adequately power the trial. For this reason, surrogate outcomes such as hospital length of stay or duration of mechanical ventilation are often used. Thus ‘free days’ are a composite endpoint that combines duration of support for survivors with the ‘hard’ clinical endpoint of mortality. Ideally, duration of support or length-of-stay should also be reported for all patients, for both survivors and non-survivors. Q7. How should the authors of clinical trials describe outcomes? CONSORT also states that available and appropriate outcomes should be reported using previously developed and validated scales or consensus guidelines. This increases the quality of measurement and assists in comparison with similar studies. The use of previously unpublished or unvalidated measurement tools is a common source of bias in trials. Importantly, if trial outcomes are changed at any stage, this should be reported by the trialists and an explanation provided. As stated back at the beginning of this ‘nuts and bolts’ episode, outcomes aren’t just important to researchers, they are are important in the real world too. For this reason, we need to know a bit about ‘Standardised Mortality Ratios’ or SMRs. Q8. What is the standardised mortality ratio (SMR) and what is it used for? The Standardised Mortality Ratio (SMR) is the ratio of the observed or actual hospital mortality and the predicted hospital mortality for a specified time period. As such, it requires an estimate of predicted mortality rate using a scoring system. ANZICS used to use APACHE, but now uses an Australasian-specific prediction tool called ANZROD (see CORE — Severity Score and Risk of Death Calculators). An SMR value of 1 is considered ‘normal’ or ‘as expected’, whereas >1 is worse than expected and < 1 is better than expected. Note that the whole plot appears shifted below and SMR of 1. 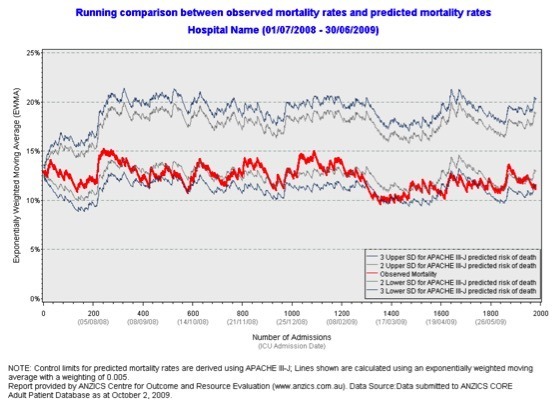 This is because the APACHE severity scores were created in the increasingly distant past using non-Australasian populations and over-estimate predicted mortality in modern Australasian ICU patients as a result. Q9. What are the advantages and disadvantages of using SMRs for comparisons of ICU performance? As with everything, there are always pros and cons.